Several months ago I tested a Wagner Paint Eater and found it to exceed my expectations. 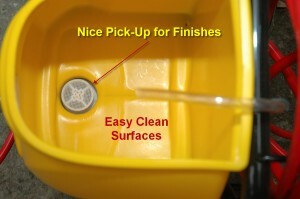 I used it for its intended purpose, removing loose paint, but also for cleaning dried grout from a tile flooring job. Wow, it blew those grout messes away! Wagner asked me to take a look at its Paint Crew product and I told them I would find a project where I could use it. Much of the painting I do is large scale residential, therefore the large airless paint systems are a godsend. This past weekend I needed to shoot a few gallons of Valspar Exterior Oil Based Primer on an outside wall I had prepped on the previous day. I immediately thought about the Paint Crew. I wasn’t shooting out of five gallon buckets and pouring the primer into my larger airless setup would mean the last gallon of primer I would be fighting air intrusion. The Wagner Paint Crew with its smaller capacity would be perfect for this task. Setup was easy. Pour the well mixed finish into the container. Prime the unit until paint flows back into the paint hopper. Turn the control to paint and test the spray pattern adjust, and paint away. The Wagner Paint Crew does an admirable job of laying down finish fast and is suitable for homeowners having large painting projects. As always we recommend back brushing or rolling as you spray to ensure an even finish with good adhesion to the undercoat. This wall is redwood board and batten construction. 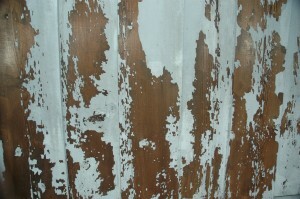 Parts of the previous paint job were flaking and had not adhered to the wood, especially where the surfaces were exposed to the weather. I pay tribute to the folks at Valspar, the exterior oil primer did a wonderful job of adhering to the redwood as well to the previous top coat. 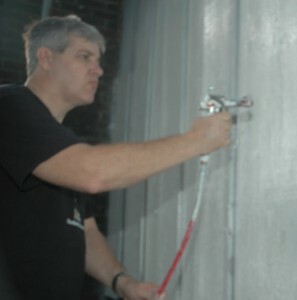 Prep work is the key element of any paint job. This area had to be thoroughly prepped due to its poor condition. Initially we pressure washed with the Husqvarna 6025 Model pressure washer with a 15 degree tip, followed by a wire brushing, followed by spot sanding and we even used a scraper to dig out rotted wood. Like I said it was in poor condition. The Paint Crew was easy to use and its gun did a nice job of laying the primer on. The system laid down paint fast enough for any homeowner seeking to speed up those larger painting projects, such as fences, exterior house painting or spraying decks and docks with waterproofing. I liked the simple controls for DIYers. Easy to understand and not intimidating to a novice. Clean up was not a problem. I ran paint thinner through the system, thinner through the priming cycle and finsihed it off by wiping down the inside of the paint hopper with a rag soaked in mineral spirits. I ran thinner through the gun until it flowed clear. 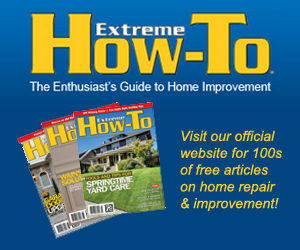 Most airless paint system problems with homeowners go back to improper cleaning. Once paint has dried inside a hose or gun, its a beast to clean it out. Often the systems are rendered worthless due to this. All in all the Wagner Paint Crew is an ideal step up from self contained airless sprayers. The Paint Crew will definitely make your larger painting tasks go by quicker. Heck you might even look for things to paint!